Looking for an upright vacuum that rivals everything else? Finding a reliable vacuum cleaner, that ticks all the boxes, is not an easy task which is why we’ve shortlisted the latest and greatest uprights to ease the time-consuming burden of endless searching amongst a sea of appliances. An important thing to remember when searching for an ideal upright vacuum cleaner is not to look for the cheapest or the most expensive vacuum. Either end of the spectrum doesn’t guarantee reliability or great cleaning performance i.e. just because a vacuum cleaner costs more than $500 doesn’t necessarily mean that it will clean better than a $250 vacuum. On the other hand, we could say the same thing about cheap vacuums, which often tend to be false economy i.e. you could end up spending more money buying a series of cheap vacuums that break down in a short amount of time. 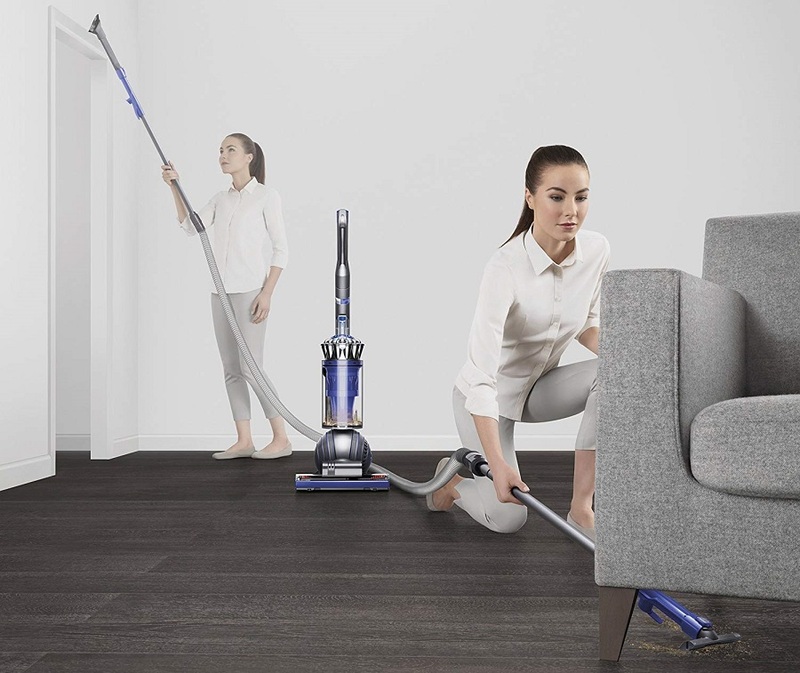 The upright vacuums on our shortlist have been chosen for their impeccable cleaning performance at sucking up small and large dirt whilst filtering the air of dust and allergens and providing durability. But they are more factors that extend beyond cleaning performance such as appliance weight, manoeuvrability, attachments provided, bin capacity, versatility and so on. Overall we are looking for an upright vacuum that provides most, if not all, of the above and gives good value for money. Upright vacuum cleaners are mostly used by their owners for carpet cleaning so naturally, we want to look for vacuums that excel at this task. Preferably you should be looking for an appliance with a brush roll that sweeps carpets effectively whilst lifting dust, dirt and food items such as cereal, rice, flour, grains and so on. If an upright vacuum does a great job on carpets it should perform a similar job on hard floors. How many times does your upright need to pass through a patch of carpet to pick up all the dirt? 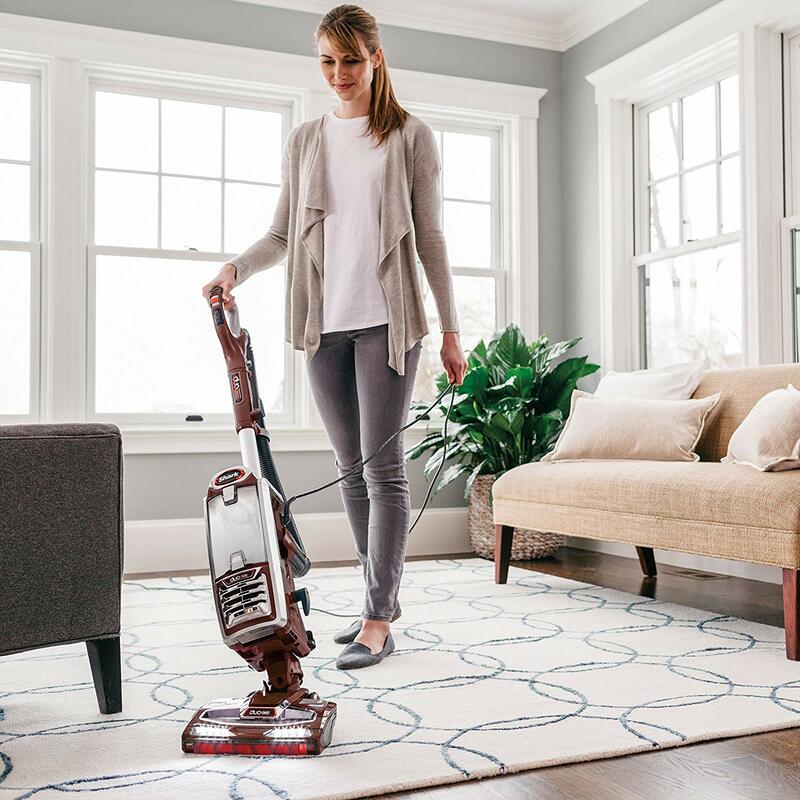 The fewer times the better, you want to avoid buying a vacuum that needs to clean the same area over and over again as this will be time-consuming and less effective. 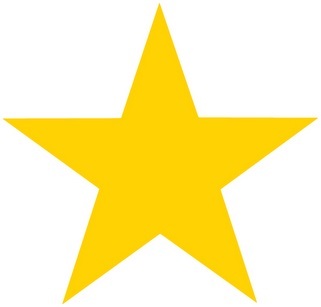 Let’s jump straight into our shortlist, I will start with the best of the best and work my way down. 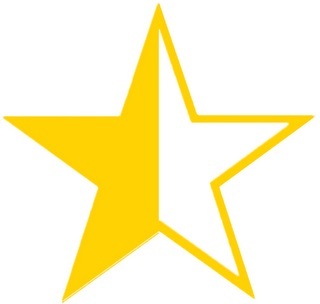 At the top of our list is the Shark Rotator with DuoClean. 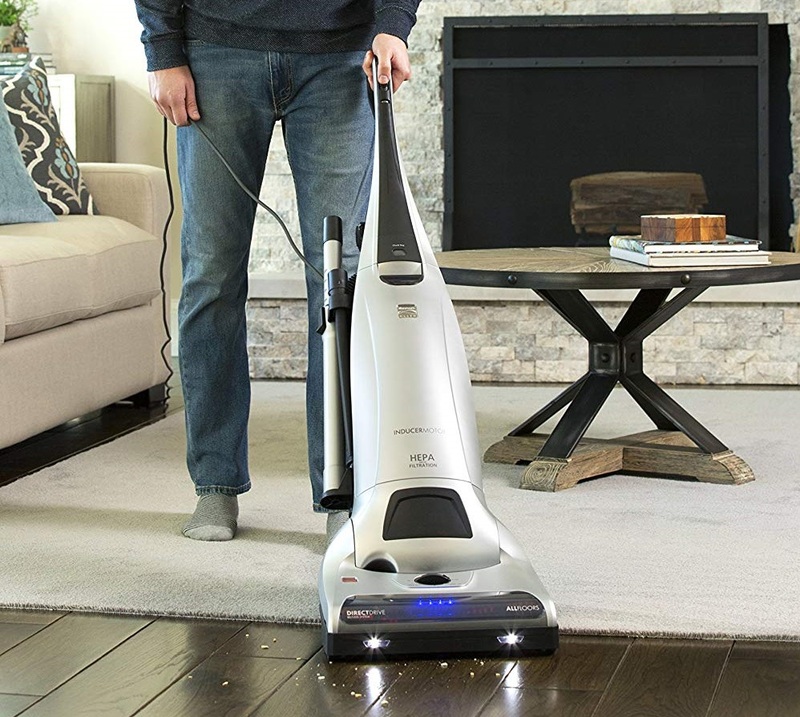 This vacuum doesn’t shy away from giving a top performance for small, medium and tough tasks. 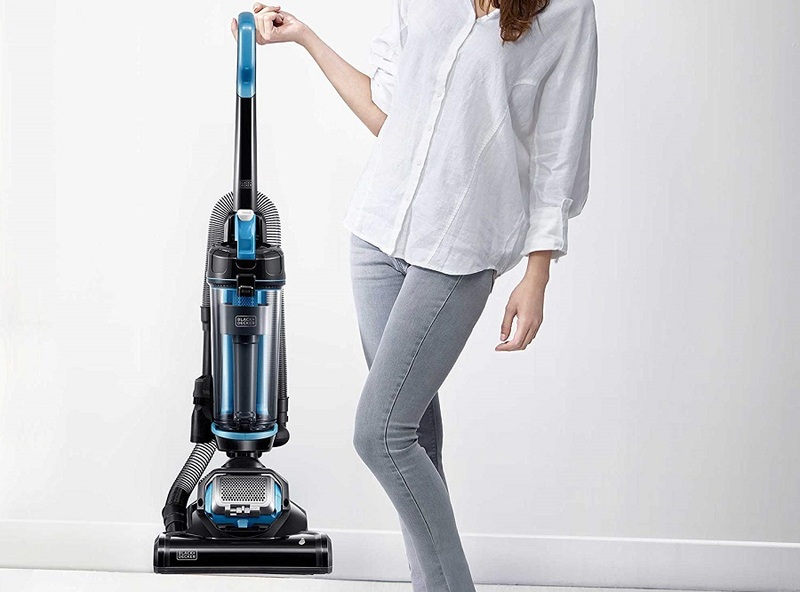 This is one of my favourite vacuum cleaner ranges and the Shark NV803 has proved to be the best overall upright vacuum cleaner because of its versatility (it can be used as an upright or handheld), lightweight body, HEPA filtration, its deep cleaning capabilities and clever accessories to make the job easier. As you can already tell, the Shark Rotator is a beast of a machine and houses plenty of features to provide you with a complete cleaning solution. The Rotator cleans any type of surface and is great at vacuuming hard floors, this is an agile appliance that steers around corners with precision. The Lift-away feature allows the machine to be removed from the upright chassis and transform into a lightweight handheld capable of cleaning hard to reach areas that a normal upright would struggle to reach including ceilings. You can navigate the Rotator underneath sofas, bed frames, furniture and lift up troublesome pet hair without much effort. The Shark Rotator NV803 is reasonably priced and is the only vacuum you would ever need for a large, medium or small house. A minor drawback of the Rotator is that it topples over sometimes when using the hose attachment with the main body whilst it’s still sat on the floor cleaning base. However, this is a small drawback when compared to the arsenal of great features packed inside this machine. The Shark rotator does not cost as much as a Dyson but is the best upright vacuum by far. If you are looking for an upright vacuum without any compromises then the Shark Rotator is the absolute best. DuoClean Technology is included inside the appliance’s portable enclosure which comprises of a dual brushroll system (bristle brush + soft brushroll) that delivers exceptional cleaning on carpets and hard flooring. Top of the range HEPA filtration and an anti-allergen system ensure that dust and allergens are separated from the air, as it travels through the machine, and trapped inside the sealed system. Intuitive controls to seamlessly switch from carpet to a hard floor setting and vice versa. Clever LED lighting is built onto the nozzle to help you identify dirt easily as you move through the house. The extension wand is highly useful to easily clean difficult confined spaces that the main machine cannot reach. Second on our list is the Kenmore Elite Pet-Friendly which has been chosen for its supreme carpet cleaning abilities. 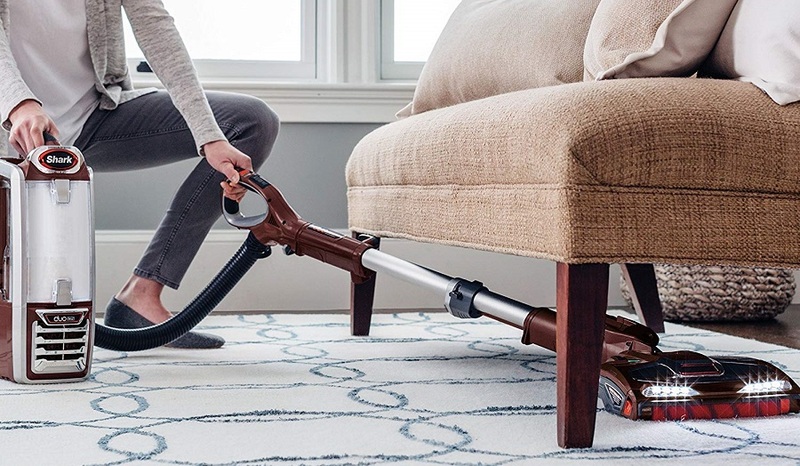 Although the design is bulkier than the other vacuums on this list, it has been chosen for its sheer carpet vacuuming prowess. Elite Pet-Friendly is a bagged appliance without all the bells and whistles of rival vacuums but if your home is mostly carpeted and you want to keep your carpets in the best possible condition then I’d highly recommend the Kenmore Elite. 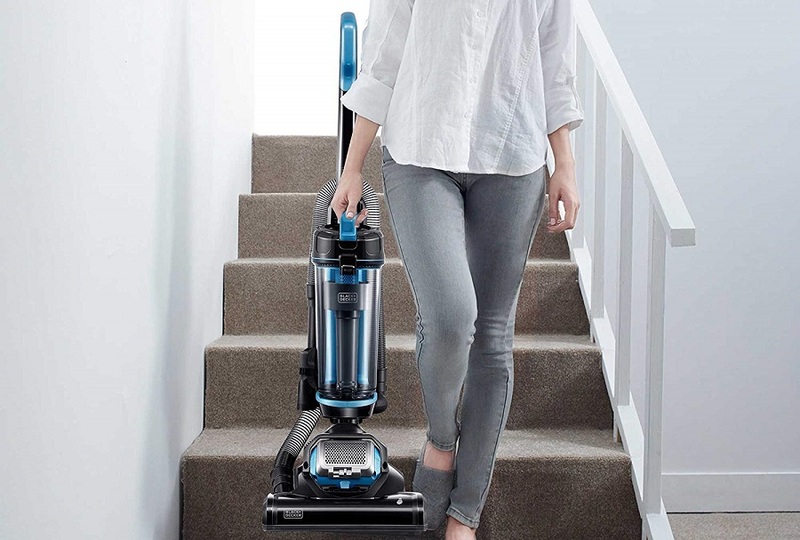 Kenmore’s brilliant cleaning comes with the compromise of manoeuvring a larger vacuum across your floors, it isn’t as agile as the Shark Lift-away, but it definitely outshines the rest of the vacuums for deep cleaning carpets. Hard floor cleaning is almost equivalent to Kenmore’s carpet performance, if you’re looking for uncompromising cleaning power in a busy household then this is a vacuum to consider. Kenmore Elite Pet-Friendly is ideal for large families in households with pets and messy kids. This appliance is built to stand the test of time. The attachments are of the highest quality, they don’t feel flimsy and are very sturdy when in use. The extension wand can extend to 10 feet and eliminates the need to fidget with various attachments. Kenmore Elite’s motor is designed to deliver 20% greater suction power than other upright vacuum cleaners. A telescopic wand attaches to the machine to clean above floor level and areas that are difficult to reach. The wand is built from high-quality aluminium and extends to 10 feet. In addition to HEPA filtration, the Kenmore vacuum is certified by the Asthma and Allergy Foundation of America. 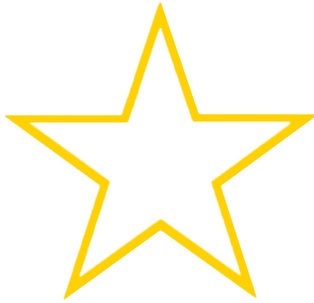 A specialist pet (handi-mate) tool is supplied for pet owners that want immaculate floors. Third on the list is another Shark vacuum. Yes, they are that good! The Shark Navigator Lift-Away Professional is a budget-friendly vacuum cleaner for anyone that doesn’t want to pay more than $200 but still wants a high-quality appliance. The Navigator excels at its dirt-lifting capabilities on carpets and is one of the front-runners at getting rid of pet hairs from floors. The machine has a good weight distribution and doesn’t feel too heavy or bulky. 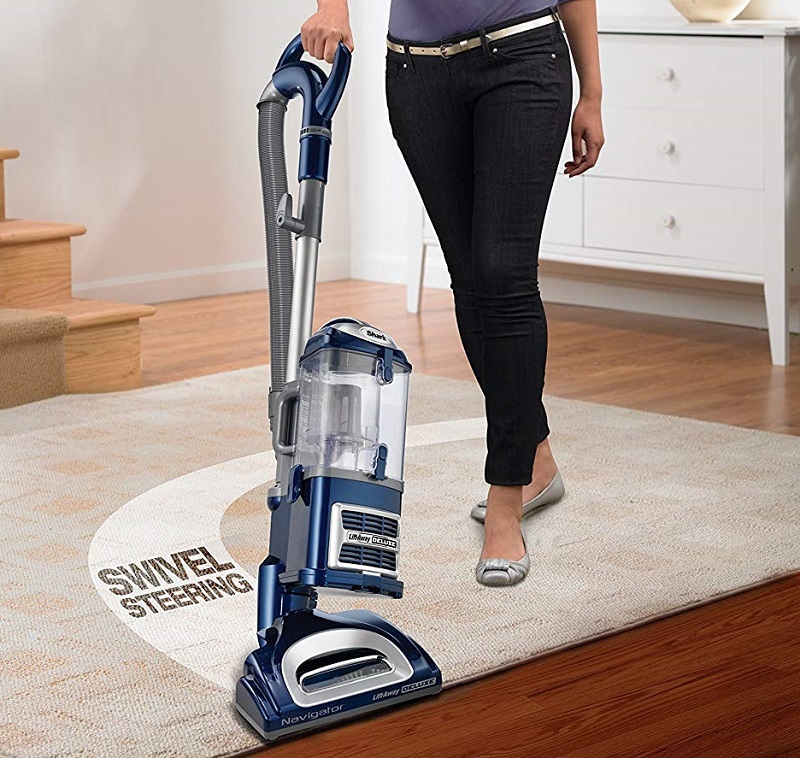 The swivel head makes it so easy to steer the vacuum around corners and throughout the house. 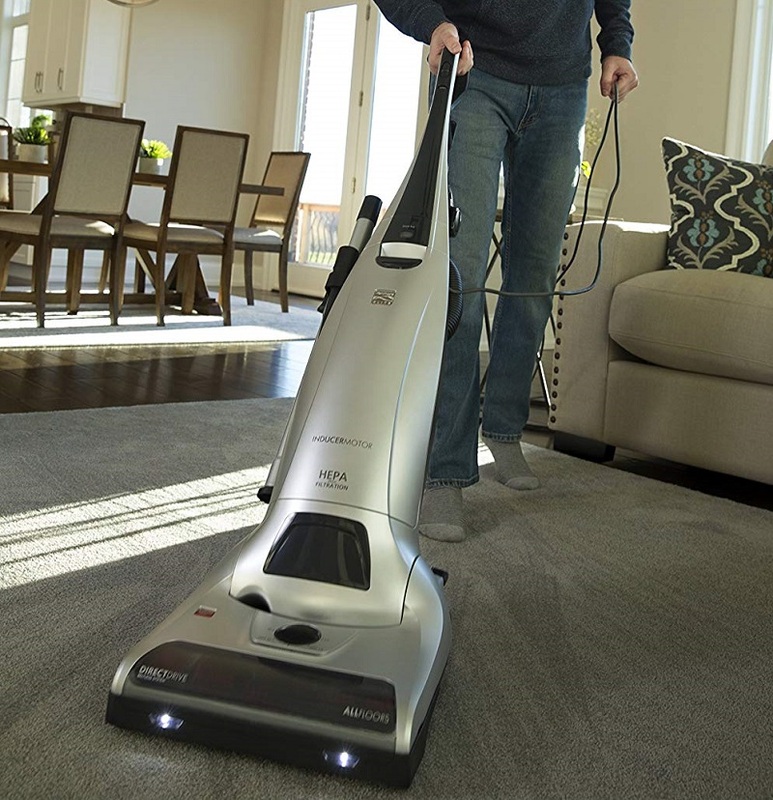 The Shark Navigator’s performance on hard floors isn’t as good as the top 2 vacuums on our list. It vacuums medium-sized dirt without issues but needs a few passes when cleaning smaller particles and larger debris. Overall, the Navigator vacuum is a front runner if you’re shopping on a lower budget. The vacuum’s cleaning performance is on par with alternative vacuums that cost considerably more money. If you’re looking for a bargain high-performance vacuum cleaner that won’t break the bank then I’d highly recommend Shark Navigator as the ideal solution for all cleaning tasks around the house. The Navigator is versatile too, simply remove the canister from its base to vacuum smaller areas, car interiors and stairs. The upholstery tool is equipped with a roller that activates as soon as it’s attached to the wand and will clean your sofas and drapes. 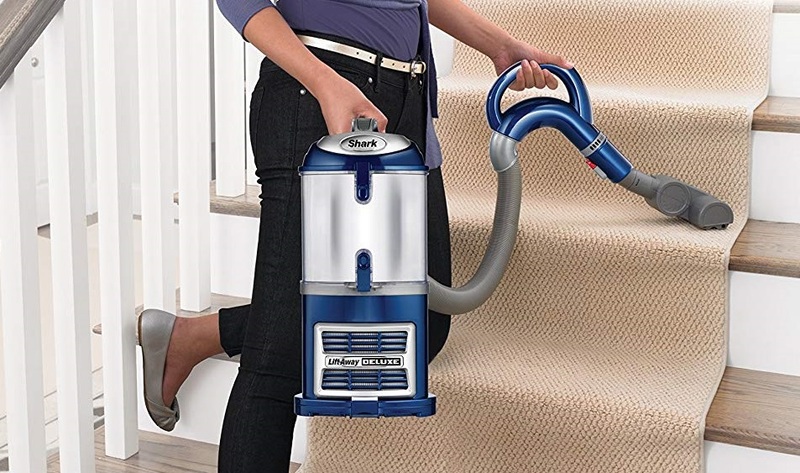 The same tool can be used to vacuum the stairs. Shark also provides a long extendible wand to clean underneath furniture and between tight gaps. The weight of the Shark Navigator has been significantly reduced compared to its predecessors. It also steers and pivots with pinpoint precision. The suction power can be adjusted depending on the type of floor, you can increase suction to clean thicker carpets and rugs. This is a no-nonsense vacuum with exceptional dirt lifting abilities and this can be noticed from the moment you turn it on. Don’t be surprised if the canister rapidly fills up with dirt on its first use, a good sign that the vacuum does a significantly better job. There’s no doubt that the Navigator will vacuum better than your previous vacuums which is why it is in the top 3. Lift-away functionality has the benefit of transforming this machine from an upright to a handheld so that you can easily clean stairs and confined spaces. HEPA filtration comes as standard and traps dust and allergens inside the canister. Pin-point manoeuvrability provides great steering and better handling of the machine around furniture and between rooms. There’s a generous dirt bin capacity of 1.2 dry quarts and it is easy to empty. Dyson makes some of the most innovative vacuum cleaners on the market and the Dyson Ball Animal 2 is an intuitive upright vacuum with heaps of suction power. 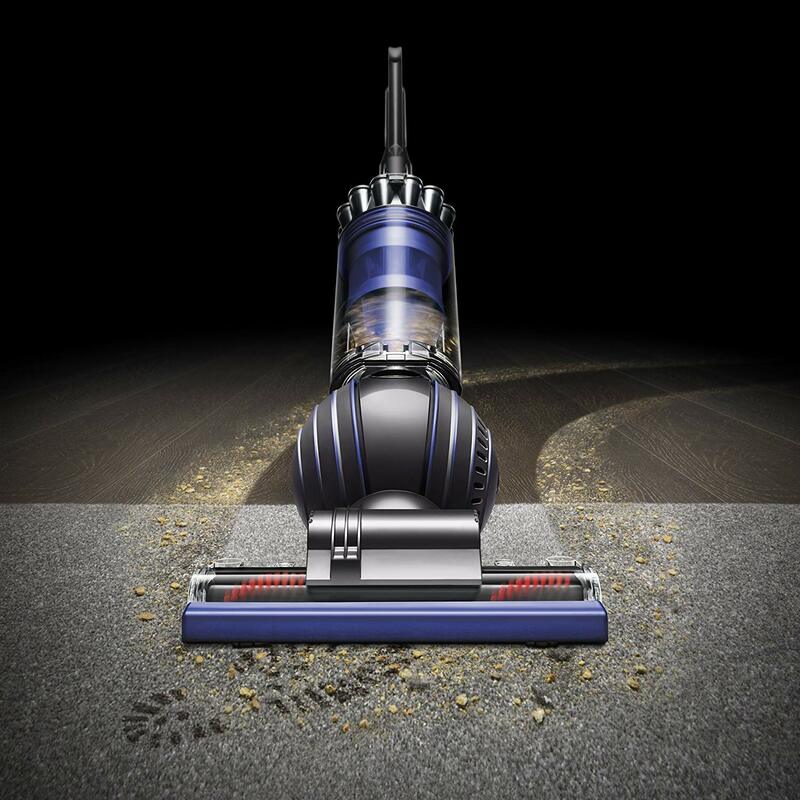 Dyson’s cyclone technology optimises the airflow to catch more dirt and dust from your floors. Choosing a Dyson machine automatically guarantees you longevity and low maintenance i.e. their filters never need replacing and the attachments are built for long-term usage. To truly understand the extent of this machine’s ergonomics and features you would need to use it. Dyson ensures that every feature is provided to the highest standard. Their HEPA filtration is certified by the Asthma Foundation and the Ball technology delivers the best steering I’ve experienced on any vacuum cleaner. Dyson was the original inventor of bagless vacuums so you can be assured that Ball Animal 2 is equipped with the cleverest bagless technology which ensures that dirt stays 100% trapped inside the canister until disposal. To experience the sheer power behind the Dyson vacuum you should vacuum your floors with your existing vacuum then use Ball Animal 2 over the same area to see the amount of dirt that was left behind, you’ll be surprised by how much dirt it will still collect from recently vacuumed floors. It is equipped with an Epicyclic Drive cleaner head with a powerful brush bar that deep cleans carpets and optimises suction on hard flooring. Dyson also provides a great variety of attachments to help clean furniture and other areas of the house that are above floor level. The tangle-free turbine tool is specially adapted for homes with pets and will ensure that you can vacuum hair effectively without tangles. You also get a stair tool and a combination tool to remove dust and cobwebs. The hose can be unclipped from the machine and attached to the extension wand or any of the above tools. The Ball Animal 2 vacuums at a low noise level and feels very sturdy when in use. It is easy to handle especially when manoeuvring around corners and all its accessories can be conveniently stored on the machine for easy access. Emptying the canister couldn’t be any easier, simply detach with the click of a button and empty within seconds. I would highly recommend this vacuum for those that suffer from airborne allergies and for busy households with pets. The Dyson Ball Animal 2 is a versatile vacuum with plenty of durable and innovative accessories to make cleaning easier and done in less time. Root cyclone technology maintains a consistent clean across all surfaces. 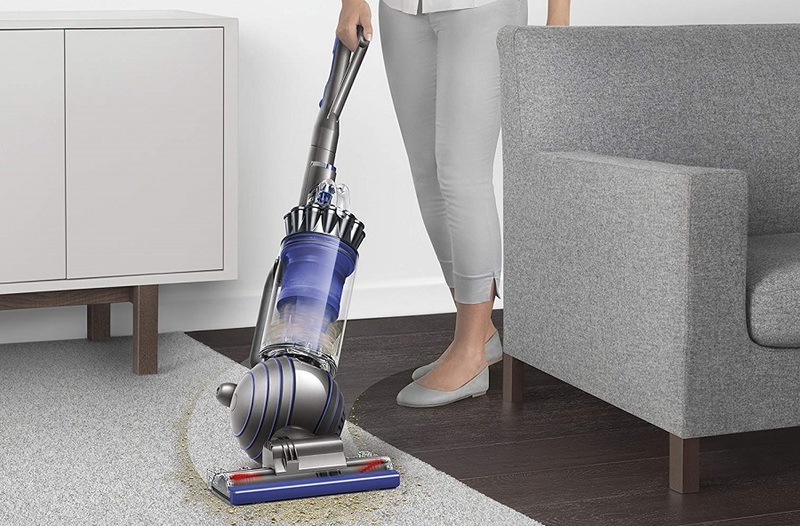 Don’t worry if your budget can’t stretch to buy a Dyson vacuum, there’s a cheaper alternative with virtually the same cleaning performance and it’s the Shark Navigator Deluxe (NV42). This vacuum is incredibly powerful. 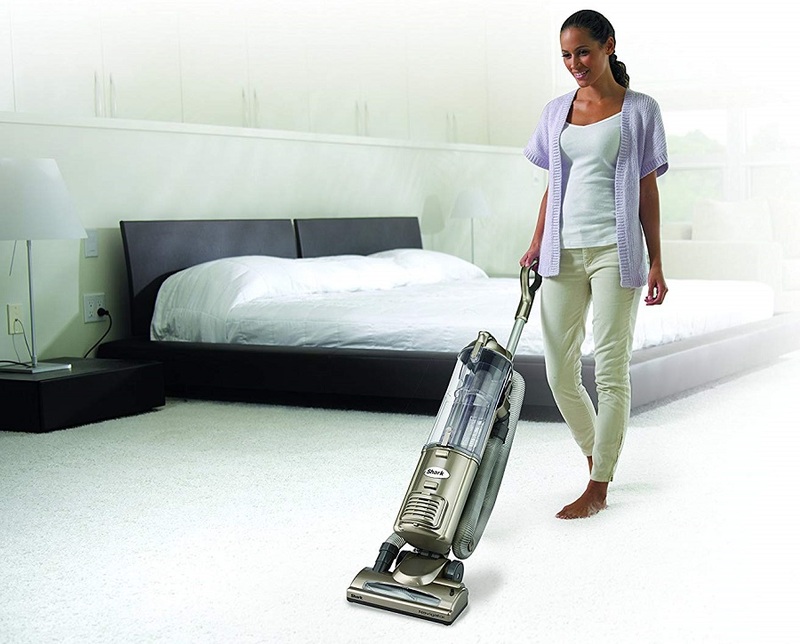 It performs on all types of surfaces including hard floors, rugs, carpets, furniture, upholstery without compromises. It seeks out pet hair from every inch of the house and eliminates troublesome dust and dirt without much effort. The Shark Navigator Deluxe is very lightweight making it a dream to handle and steer. It vacuums quieter than similar upright vacuums and takes less than a minute to assemble for its first use. This is the best affordable upright vacuum for deep cleaning carpets and currently costs less than $130. At first, I was sceptical whether the Shark would clean to the same high standard as a Dyson but my doubts were put to rest after a few carpet sweeps. This machine is a cleaning beast and will clean even the grimiest of floors. 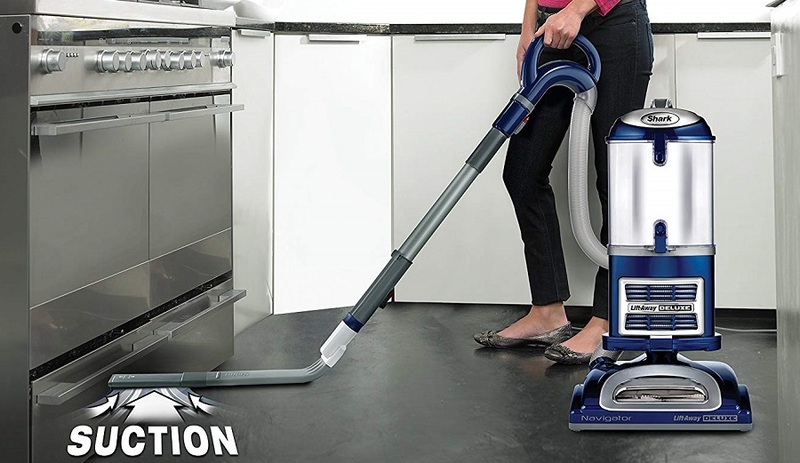 The Shark Navigator Deluxe gives you brilliant cleaning performance at a fraction of the cost. I was surprised to see a few unwarranted negative reviews against this Shark vacuum which I honestly don’t think it deserved. After reading those reviews I was expecting a terrible cleaning experience especially when I saw the low price point. After using the Shark for just a day I could confidently ignore the negative comments, I had no issues with its cleaning performance, handling or anything else for that matter. If you are looking for a powerful and reliable vacuum cleaner that costs less than $130 I would recommend buying the Shark Navigator Deluxe. It costs considerably less than other premium vacuums but delivers an equivalent amount of dirt lifting performance. The Bissell Cleanview upright is a very affordable vacuum cleaner with the unique advantage that it doesn’t require you to go over the same areas more than once to collect all the dirt. It is designed with a One Pass system that delivers powerful suction to make sure that dirt is not left behind. It works hand in hand with the brush bar to provide a combination of powerful suction and sweeping action. I’m pleased to see that multi-cyclone technology is provided at such a low price point and the machine is built around a lightweight body for easier handling. The Bissell clean view provides high performance and good value. High-grade washable filters deliver multiple filtration to eliminate dust and airborne allergens, whilst keeping the maintenance costs very low. The dirt bin is bagless and has a large capacity for less frequent emptying. Dirt disposal is fast thanks to the bottom-empty system that speeds up emptying whilst keeping the whole process hygienic. Bissell clean view comes equipped with attachments for smaller tasks and to clean areas that are harder to reach. You will get a crevice tool for tight gaps, a dusting brush for delicate surfaces, and a Turbo brush tool to clean stairs, furniture and sofas. Bissell Cleanview upright is a champ at cleaning up pet hair. Unleash it onto your carpets and you’ll be impressed at the amount of dirt and hair it will collect in a short amount of time. Initial I wasn’t sure whether the one pass technology would live up to its claim of collecting dirt in one sweep, Bissell Cleanview did as stated on the tin and honestly didn’t need to go over the same area multiple times. You get great suction and brush bar sweeping to provide a uniform clean in a single pass. This speeds up cleaning and saves time. Multi-cyclone suction delivers long-lasting suction power that lifts dirt and traps it inside the dirt bin. The filters are washable and provide staged filtration to extract dust and allergens from the air as it travels through the machine. I like that the appliance is lighter than it looks making it easy to handle whilst keeping a high level of performance. Last but not least is the Black & Decker Airswivel. This is the cheapest vacuum on our list but we’ve ensured that we’ve chosen an appliance that does a good job for anybody that doesn’t want to spend more than $55 on a vacuum cleaner. The best thing about the Airswivel vacuum is the high level of cleaning on carpets in households with pets. I wouldn’t expect a cheap upright to give such great results but it got the whole house clean in no time. The Airswivel weighs just 8.8lbs making it an ideal lightweight upright vacuum that won’t cause fatigue to your arms and wrist. It handles well and the big shocker was the amount of suction power it produced. The Airswivel is very powerful for a lightweight vacuum! It excels at picking up fine particles of dirt such as flour and sand. It is easy to assemble and the instructions are easy to follow. You might not expect this vacuum to clean as good as machines that cost more than 5 times its price but I think you’ll be surprised by its cleaning quality. 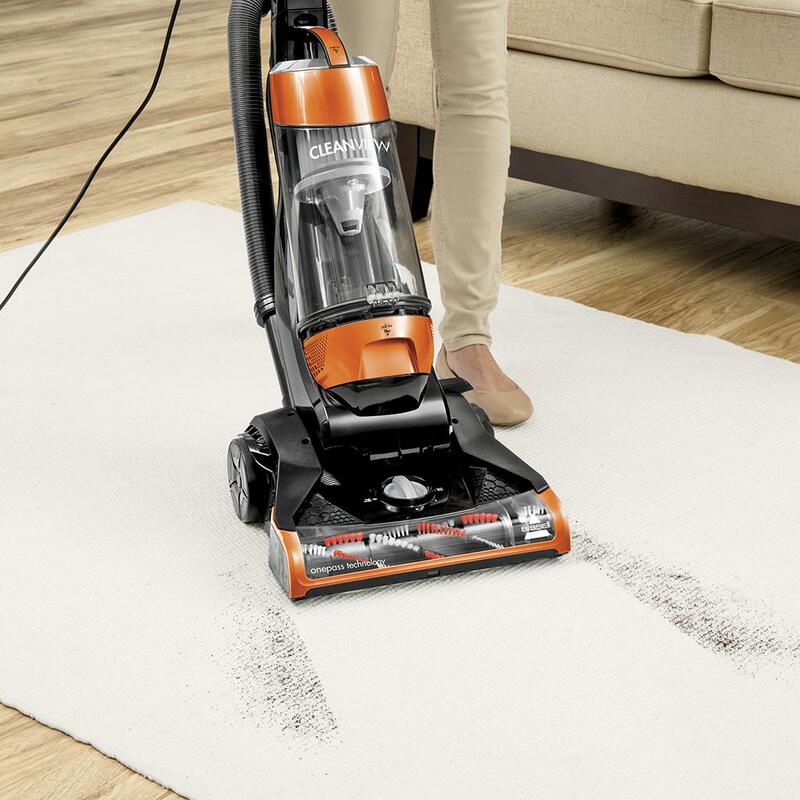 Why not save yourself a lot of money and try out this Black & Decker vacuum. A spare replacement belt is also supplied with the machine should you need it later on. It manoeuvres brilliantly with swivel steering. There’s a large dirt bin capacity of 2 litres for longer intervals between bin emptying. Clever user-friendly handle designed to optimise machine use. The foam filters are washable and lower the cost of maintenance even further. The dirt bin is extremely easy to empty. 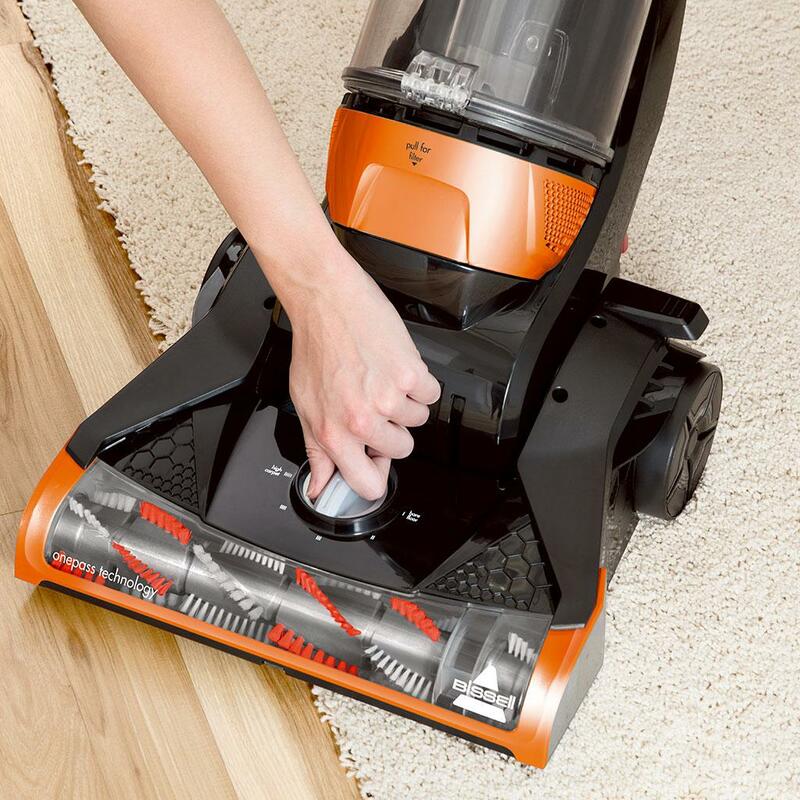 The Black & Decker Airswivel is perfect for carpets and hard flooring. It cleans both types of surfaces consistently. A transparent nozzle window to view the cleaner head and inspect if it needs cleaning out. 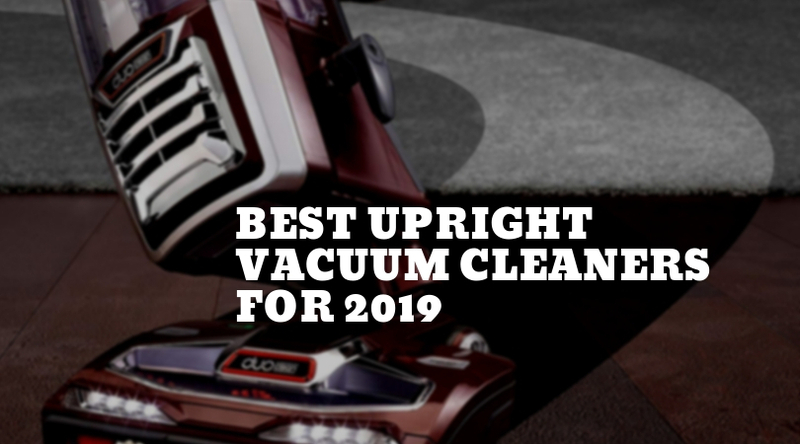 That concludes our shortlist of the best upright vacuum cleaners for 2019. We’ve included a range of vacuums to suit big and small budgets. 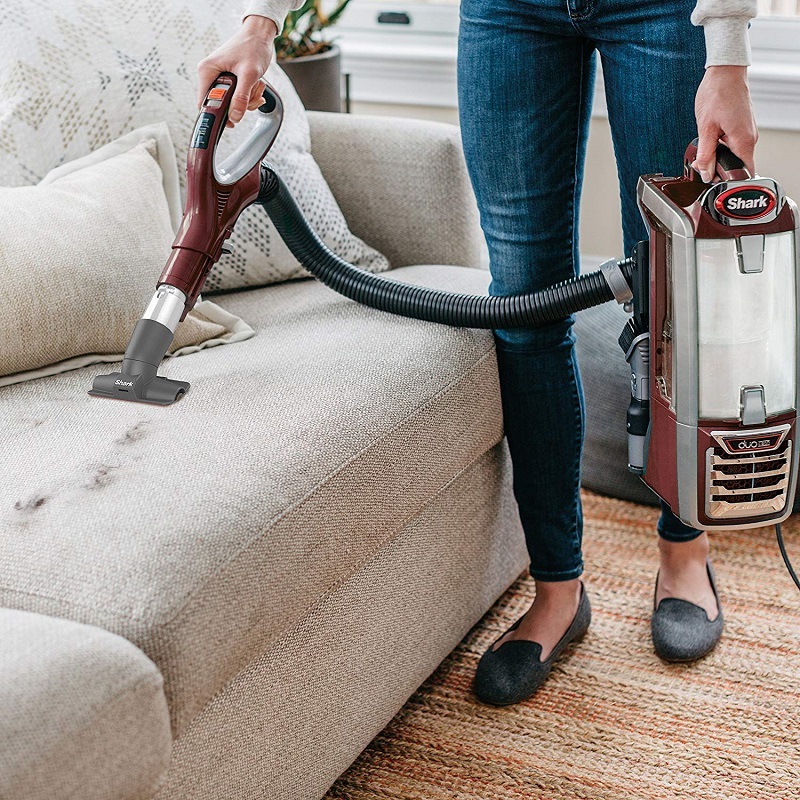 Whether you’re after a versatile upright vacuum or one with HEPA filtration for allergy sufferers you will find the perfect appliance to suit your requirements and your wallet. When it comes to upright vacuum cleaners the brand that standouts for me are Shark. 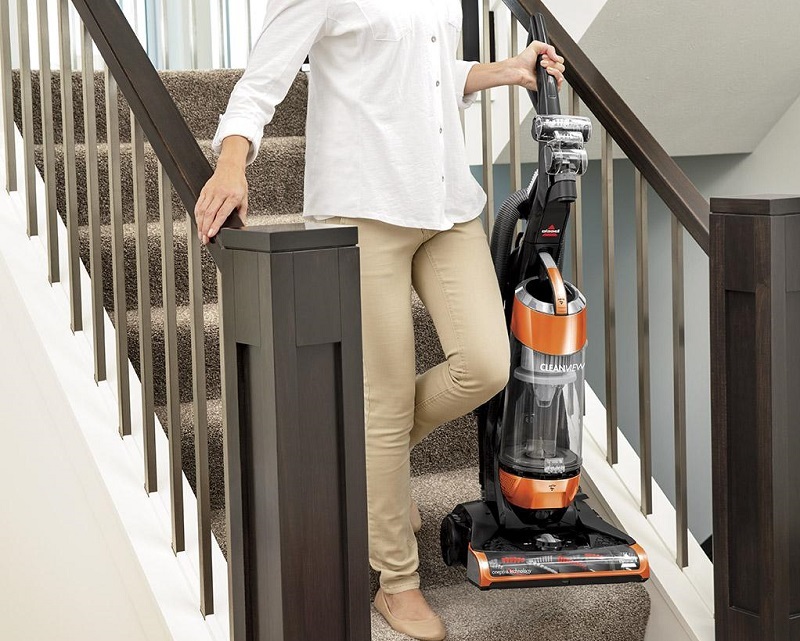 Their lift-away range truly is the best of both worlds, it transforms from upright to handheld to give you that added flexibility and quite frankly I think we all need this type of convenience to simplify house cleaning and get it out of the way so we can get on with the thing we enjoy. 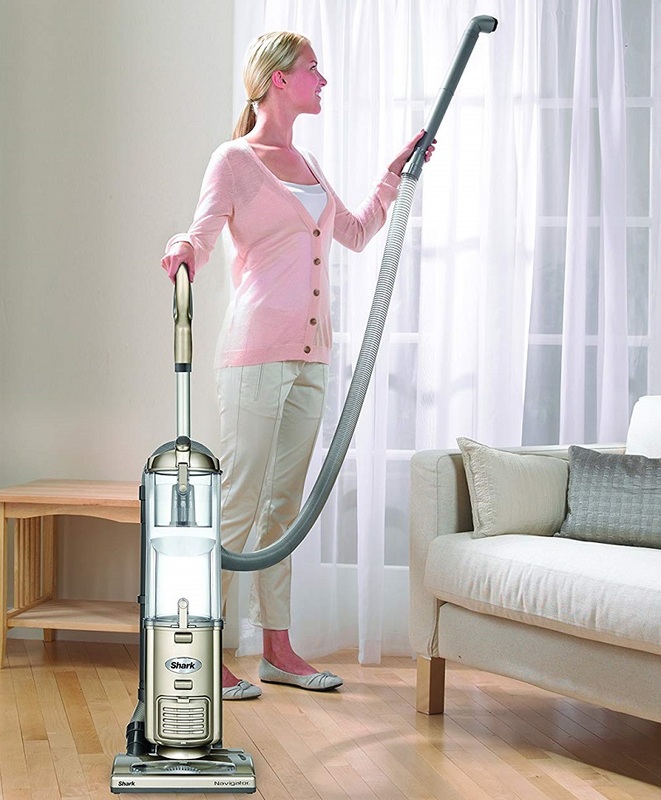 Are you considering buying one of the Upright vacuums from our list or do you already own one? Please leave your comments in the section below. I’d love to hear from you.